Cleric of Kyne is a common Willpower creature card. It is part of the Heroes of Skyrim expansion. "Bless us, Kyne! May we serve you with every word." This card's summon ability applies the Kyne's Blessing card effect. 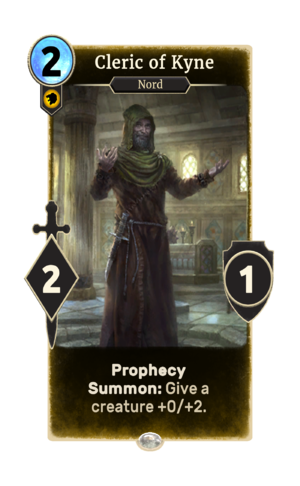 The background of this card depicts Whiterun's Temple of Kynareth as it appears in Skyrim. This page was last modified on 27 February 2019, at 22:55.